Amb. David Friedman sends letter of condolences to terror victim Raziel Shevach's widow and orphans, hints he will visit in person. 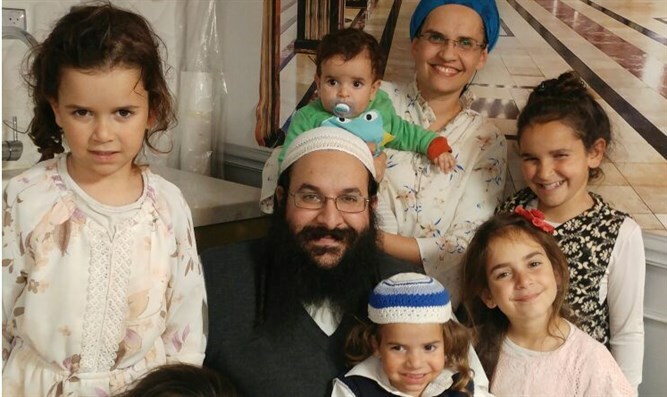 US Ambassador to Israel David Friedman sent on Monday an official letter of condolences to the wife and children of Rabbi Raziel Shevach, who was murdered last Tuesday evening in a shooting attack in Samaria. Rabbi Revach, 35, was shot by Palestinian Authority Arab terrorists as he drove near Havat Gilad. He left behind his wife Yael and six children, the youngest of whom is ten months old. On behalf of the United States, I offer our nation's heartfelt condolences upon the tragic murder of your husband and father, Rabbi Raziel Shevach. I was alerted to Rav Shevach's passing this past Wednesday, shortly before boarding a plane for a brief trip to the United States. Upon landing and restoring my email, I had already received countless communications extolling the virtues of this very special man. As an emergency first responder, mohel, and a revered teacher, Rav Shevach clearly was an extraordinary person more concerned with others than with himself. He epitomized the hard working, dedicated individuals who have built and sustained the State of Israel. Above all else, however, Rav Shevach was a devoted and caring father and husband. You, Yael, and your six children will always be a lasting legacy of this sacred life that ended far too soon. I had hoped to deliver these words of sympathy to you personally during your period of shiva, but my schedule requires that I be out of the country for a few more days. Please accept this letter in the interim until we are able to meet in person. Wishing you no further sorrow and may Rav Shevach's memory be a blessing to your entire family. Yehi zichro baruch (may his memory be blessed - ed.). May G-d comfort you amongst the other mourners of Zion and Jerusalem. Israel has promised to find the murderers, and the IDF has stationed soldiers at entrances and exits to the city of Shechem (Nablus), as well as in intersections and central locations in Judea and Samaria.